Whomp's Fortress, also known as the Whomp King's Fortress, is the stronghold home of the Whomp race and their leader, the Whomp King. It is the second level in Super Mario 64 and its Nintendo DS remake, Super Mario 64 DS, and can be accessed via a painting on the first floor of Princess Peach's Castle. Only one Power Star is needed to unlock the door to the room containing the painting. The level received some additional elements and platforms in the Nintendo DS remake and was remade for Super Mario Galaxy 2 under the name Throwback Galaxy. In addition, the Whomp's Fortress painting that appears in Super Mario 64 also appears in the Super Mario Mash-Up Pack of Minecraft as one of the paintings that can be hung on a wall. Whomp's Fortress is a large, tall, stone fortress populated by Whomps, Thwomps, and Piranha Plants. The player starts off in a field area at the base of the fortress, which contains some patches of flowers, a Piranha Plant, some Goombas, and this course's Star Marker. The tree at the start of the level also contains Hoot during certain missions. At the top of the nearby ramp are some Moving Bars that will try to shove the player off the ledge. After those are gaps with receding platforms over them followed by a couple of Thwomps guarding a set of stairs to the upper area. Near the Thwomps are a green ! Block and a warp that will take the player further up the fortress. The path splits at the top of the stairs, with the ramp going downward leading to a pool of water, a Bob-omb Buddy and a cannon, and a small area with some Goombas and the right path leading to the top of the fortress and contains Piranha Plants, Whomps, and both a falling and turning bridges. 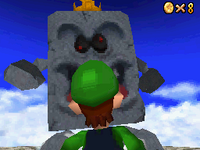 At the top of the fortress is the Whomp King, though only during the first mission. Every other mission has a tall tower with receding steps at the top of the fortress. 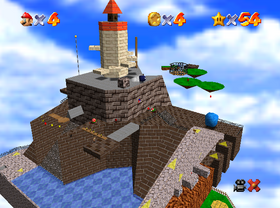 Above the course are several platforms that can be reached either by using Hoot to fly up there or by knocking over a board at the top of the fortress. Super Mario 64 DS has additional platforms going around the base of the fortress that can be reached by jumping over the fence near the start or by Long Jumping over the fence at the area with the Goombas a Blue Coin Block near the cannon. This new area contains the Star Switch and Star Sphere (at opposite ends), more Piranha Plants, a Turtle Cannon, and a Mega Mushroom the player can find by breaking a Block. Super Mario 64 DS This mission involves fighting the Whomp King at the top of the Fortress by ground-pounding him thrice. Super Mario 64 DS The mission's objective involves climbing to the top to obtain the Power Star. Super Mario 64 DS This mission involves grabbing a Power Star located on a floating platform by using a cannon. Super Mario 64 DS This mission involves collecting all eight Red Coins spread across the Fortress. Super Mario 64 DS The mission's goal is to collect a Power Star surrounded by a cage. Super Mario 64 DS The goal of this mission is to collect the Power Star hidden inside a wall, with the use of a cannon. Super Mario 64 DS This mission's objective is to use the Star Switch to collect the Power Star behind the fortress. Bob-omb only if ! Block hit with no cap or if Mario hits ? Block (DS). The similar level in Super Mario Galaxy 2. The bonus island can be seen in the distance. A near-perfect replica of Whomp's Fortress appears in the game Super Mario Galaxy 2 as the Throwback Galaxy. The graphics have been redesigned, the music has been recomposed, and the level layout is basically the same with some minor differences, such as a Checkpoint Flag at the top of the fortress, Star Bits around the level, a Chance Cube near the beginning, and the removal of Hoot. The floating isles were removed, although a bonus planet was added, most likely replacing the said islands. Unlike the original, the walls are automatically blasted away, suggesting Mario revisits the same place as in Super Mario 64. Also suggesting this is the fact one Bob-omb Buddy says Mario/Luigi looks familiar. This is probably because he has seen him in Super Mario 64 or, in the case of Luigi, its DS remake. Also, the player fights a Whomp at the top of the fortress, as opposed to the King himself, then drops down to the underside of the planet to fight the Whomp King. This difference was to probably trick players of the original game into thinking that he was the Whomp King, as Whomps had been greatly increased in size to be almost identical to Whomp King, while the King was made even bigger. Homing Mushroom : #1 In the the top of the giant pole. Static Mushrooms : #2 Hidden inside the tower, Mario can punch the wall at the back to get it. Triggered Mushroom : #3 Appears after collecting coins above the spinning bridge. Butterfly Mushroom : #4 Mario can punch one of the butterflies in the bush nearest to the Star Marker. Mario can stand in the corner near the Metal Cap Block to warp above the platform with the giant pole. 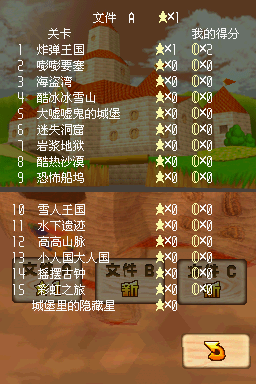 ↑ From the score sheetMedia:SM64DS course list in Chinese.png of Super Mario 64 DS as localized by iQue.